Susan Reitman's signs on Seavey Lane are larger than city code allows, but the City Council may reconsider the ordinance. ROCKLAND — City officials are expected to hold off issuing a formal notice of violation to a homeowner displaying oversized President Trump signs until the City Council has a chance to weigh in on whether the sign law should be tweaked. 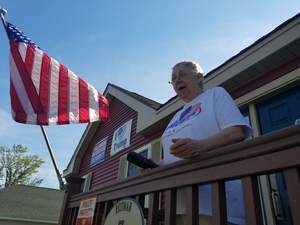 Rockland City Manager Tom Luttrell said there was no sense going forward with formal legal proceedings if the council wants to amend the law to exempt political signs. The council is next scheduled to meet Oct. 2 to set its agenda for the regular monthly meeting on Oct. 11. Mayor Will Clayton issued a statement Thursday after being asked by the Courier-Gazette about the sign issue. “The Code office is simply doing its job that past councils have asked them to enforce. City ordinances can be and are amended nearly every month and this may be a case to review this particular one. Maybe the size dictated in the current ordinance has some history to it, or maybe it’s just an arbitrary number. Whatever the history behind it is, any council member can bring forward an amendment for review at any time. Personally I will continue to focus on more pressing concerns facing the city,” Clayton said. Assistant Code Enforcement Officer William Butler sent a Sept. 18 email to Seavey Lane resident Susan Reitman informing her that two signs she had attached to the gate to her driveway were larger than allowed for residential properties. He stressed to her, however, that the issue was the size of the signs, not their message. “I admire your passion for our president. Truly, I do. However, we have received a complaint and I have to do my due diligence and I have determined your signs are not in compliance with the Rockland Code. It is your business what you put on the signs. It is the city’s business regarding the size and number of signs,” Butler stated in his Sept. 18 email to Reitman. The complaint came from a woman whom Butler has declined to identify, saying she feared for her safety if her name became public. He released an email the woman sent but the email did not include a name, only an email address and a photo of the signs. Reitman has said she would go to jail rather than take down the signs. The notice from the assistant code officer never mentioned jail. No jail term would be considered unless the city filed a land-use complaint against Reitman and a judge agreed that she was in violation, and then Reitman refused to adhere to the court order. Butler gave Reitman until Sept. 22 to remove the signs. Since the issue gained publicity, Butler has received six calls and emails from the public, including a couple that include obscene and hateful speech. The city’s sign ordinance limits residences to one sign attached to a structure of no more than 2 square feet, or one free-standing sign of no more than 4 square feet. The ordinance carries a potential penalty of between $100 and $1,000 per day for violations. Reitman moved the signs this week from the gate of her driveway to the exterior of the front of the ranch-style house. According to the ordinance, attaching the signs to the house has no bearing on what size they can be.